Just last week, a few Caribbean nationals joked that The Bahamas is the 51st state of the United States of America. As you can imagine, I was not amused and jumped to the defensive in true Bahamian fashion. Although I would never admit it to my regional brethren, I must reluctantly confess that there was a bit of truth to their satirical claims. For someone who loves The Bahamas and our culture (or what remains of it) like myself, there is nothing that hurts more than the truth. It's rake-n-scrape. It's rhyming, the way we Bahamians do it. It's rushing, both in the streets, and around our churches. It's the double-rack, the heel-and-toe, the anthem, the story-song that we use to keep one another entertained. It's that real Bahamian guitar riff, it's the way the stomach jumps when a real bass rhythm is played. It's the rescuing of trash, the conversion of ordinary, undervalued objects like cardboard and paper into works of art. It's the way we laugh when the cowbells start, the way we dance when we hear the beat. What "the world" wants is stuff that's raw, that isn't over-processed. What "the world" wants is something that makes "the world" remember its own humanity. And what "the world" wants we have.... We must listen to our music, not just to the people who are popular now, but to our fathers and grandfathers and their fathers, to draw upon all the richness that is ours. And then we must take what we learn from both, and create-and package to sell-our own. From the Arawaks right down to the Bahamians of the present, Bahamian culture and literature has been produced under a situation of dependency, in the sense that the needs and hopes of the Bahamian people to chart and direct our own economic and political destinies, to create societies which responded to our way of being and developed according to our own ideas ... have constantly been sidetracked by the imposition on Bahamians of the ideas, plans, and needs of forces that have come from outside the area. The epigraphs opening this chapter combine to paint a picture of several pressures facing the Bahamas-pressures that continue to shape dilemmas and challenges for which solutions have not been readily forthcoming. The first of these epigraphs succinctly illustrates the interposition of the Bahamas between the United States and the rest of the Caribbean, a space in-between that serves to highlight and intensify questions of cultural identity, raising the specter of the nation-and of nationalism in particular-in the process. Nicolette Bethel, director of culture for the Bahamas, transposes these questions of cultural identity neatly onto the "national" product that the Bahamas presents and sells to the world. According to Bethel, however, that export product stands in need of a bit of an overhaul, one that can be realized by understanding that the power of cultural identity and cultural production rests in the past to be recovered for use in the present. The comments of Anthony Dahl, for their part, suggest that the nation's colonial and postcolonial histories have powerfully affected and continue to affect the conditions of possibility for pursuing the project that Nicolette Bethel proposes. Throughout this book, I suggest that Bahamian musical life has been deeply influenced and shaped by three separate but deeply interrelated themes embedded in these epigraphs: the physical interposition of the Bahamas between the United States and the rest of the Caribbean, tourism, and the nation's colonial and postcolonial histories. These geographic, economic, and political influences, moreover, are unthinkable without considering the ways that travel is implicated in each of them-that is, the centrifugal and centripetal routes that are taken through them. For travel operates at several registers in the Bahamian context, including human itineraries, musical migrations and media flows, and journeys related to time and nostalgia. The physical travels I explore in the chapters that follow include the journeys of Bahamians within and outside the nation; the influx of Caribbean migrants from places such as Haiti, Trinidad, and Jamaica; and the itineraries of tourists who flock to places like Paradise Island and Freeport, enjoying (or consuming) the sun, sea, and sand of the Caribbean (Sheller 2003). The musical migrations and media flows I trace here, moreover, highlight the internal center-periphery migrations attendant to Bahamian music (Nassau/Freeport-Family Islands) while also illustrating the long-standing and intimate relationships instantiated between Bahamian musics and the musics of the islands' Caribbean neighbors (Trinidad, Jamaica, Cuba, and Haiti in particular). In addition, Florida-based radio stations, and more recently cable television, have instantiated other networks of musical and cultural relationships-other journeys that continue to powerfully affect musical production and reception in the Bahamas. Leading up to and in the wake of independence in 1973, Bahamians increasingly found themselves considering what it sounds, looks, and feels like to be Bahamian, resulting in a concerted attempt by those concerned with cultural politics to explore the riches of the Bahamian past for answers to these questions. The narratives that emerge from these constructions of Bahamianness, from the process of what Svetlana Boym (2002) has called "prospective nostalgia," have resulted in a dynamic by virtue of which the "Real Bahamas" is (re)located in the past to be recovered in the present. These journeys of memory, time, and nostalgia, then, constitute the third register of travel with which I think about Bahamian musics throughout the book. These registers of travel, furthermore, are all complicated exponentially by the geopolitical structure of the Bahamas itself, not least because the geography of the archipelago marks the center-periphery relationships always attendant to the nation-state in the starkest of terms. Citizens who live on New Providence or Grand Bahama are located in the center. Those who do not are separated from the center not only in terms of the diminished resources and infrastructure available to them but also by virtue of their being physically isolated from the everyday political life of the nation. Regardless of the power relationships forged between various locations within the nation, though, the Bahamas as a whole remains peripheral within the larger context of the Caribbean. The centrifugal and centripetal flows that inform the musical travels I explore thus operate both with respect to the internal shape of the nation itself and in relation to the place of the nation within the region. These various approaches to place combine to allow for more nuanced readings of, say, Bay Street, or Nassau, or the Family Islands in relation to the routes that lead to and from those particular places. They allow for an archaeology of many different kinds of presences, and they invite readings of place that privilege analysis of all the registers that make a place particular: the people (both resident and visiting), the homes (of both residents and visitors), the sounds (both local and nonlocal), the histories (local, regional, personal, national), the various networks (travel agencies, governmental institutions, media flows, personal and business relationships, etc.) that are combined, recombined, and put "in play" in that fluid process. Music, moreover, provides a particularly appropriate and useful means of interrogating-reading-the "ghostly presences of place" described by Minca and Oakes. The following journey through landscapes of the pre-nation and across spaces within the postcolony, then, provides a context within which to situate the musical explorations I examine in this book. The Bahamas is a place in between-the first and best example of an itinerary in the New World. The images commonly associated with the Bahamas illustrate this quite well: the Bahamas is a collection of places that have served as a gateway for Columbus; a refuge for pirates; a hot spot for wrecking (salvage work); a way station for blockade runners; a staging area for rumrunners; and, more recently, a resort playground for tourists. Significantly, even these crude characterizations of Bahamian participation in regional history indicate how firmly the Bahamas came to be interpolated between the Caribbean and the United States, between the New World and the Old. Part of this betweenness is directly related to the geography and geology of the archipelago itself. Comprising some seven hundred islands and cays and spread across about fifty-five hundred square miles at the juncture of the Atlantic Ocean and Caribbean Sea, the Bahamas has historically struggled with the fragmented nature of its own physical layout while simultaneously serving as a gateway to the Caribbean and the Gulf of Mexico. Very few mineral resources and a general lack of freshwater and arable land (there is only one river in the Bahamas, and the soil, where it can be found in the mostly rocky limestone islands, is very thin) made the Bahamas far less attractive to colonial powers than were, say, Hispaniola or Cuba. The Bahamas, then as now, was not an ideal location for what Antonio Benítez-Rojo (1996) has called "Columbus's machine"-the plantation. The Bahamas nevertheless supported an estimated twenty thousand Lucayans (the islands' native people) by the time those living on the island they called Guanahani first encountered Christopher Columbus (October 12, 1492). Columbus quickly claimed all that he could see for the Spanish crown, christening the island San Salvador, and having failed to find sufficient quantities of gold, compelling seven Lucayans to board his ship and guide it deeper into the archipelago. The callous disposition toward the Lucayans at evidence in his log entry for October 14, 1492, is perhaps a harbinger of things to come for the Bahamas: "These people are very unskilled in arms, as Your Highness will see from the seven that I caused to be taken to carry them off to learn our language and return; unless Your Highness should order them all to be taken to Castile or held captive in the same island, for with 50 men they could all be subjected and made to do all that one wished" (quoted in Morison 1963, 68). The violence of this encounter, both in symbolic and physical terms, often overshadows the strategic deflection accomplished by the Lucayans that October. The Bahamas was not what Columbus was looking for, and the Lucayans underscored that by pointing him in the direction of the gold (or perhaps more pragmatically, away from the Bahamas). This initial encounter was, however, only the first of many, and the initial deflection to other locations in the Caribbean seems only to have focused the colonial gaze on other possibilities. Accordingly, subsequent encounters were much more devastating, for the Bahamas came to be mined for the only resource useful to the colonial effort: the Lucayans themselves. Systematically relocated to the mines of Hispaniola and, a bit later, to the pearl beds off Cubagua, the Lucayans were soon living and dying in slavery far from home. As Michael Craton and Gail Saunders point out, "Ponce de León as early as 1513 came to the conclusion that the islands were completely empty of people" (Craton and Saunders 1992, 55). This genocidal exploitation of Lucayans, accomplished in a staggeringly short space of twenty-some years, illustrates the role of the Bahamas within Columbus's machine. The people, not the place, could be exploited. The ensuing century witnessed the Bahamian archipelago standing essentially empty at the front door of the Caribbean. Because the Bahamas was virtually ignored by Spain and experienced only unsuccessful claims to settlement by the French (primarily a failed twin settlement in Abaco, founded in 1565), it was the English who first managed to establish permanent settlement in the Bahamas starting in 1648, when the Eleutheran Adventurers (a group of religious independents led by William Sayle) made landfall from Bermuda and laid claim to the territory. Some 150 years after Columbus's first landfall, however, little had changed. The archipelago, which had thus far proved next to useless to the colonial project, in fact provided very little from which the Eleutheran Adventurers would be able to craft a significant livelihood or move into the mainstream of exchange. The new inhabitants were, from the beginning, placed at a distinct disadvantage simply by virtue of their chosen location, as Craton and Saunders point out: "The Bahamas presents a particularly awkward and atypical picture: playing no part in the general [colonial] process before the mid-seventeenth century, first peopled by a thin trickle of settlers from Bermuda ... gradually reinforced by heterogeneous recruits from all points of the compass, and seeking a livelihood without plantations that when not actually parasitic (during the age of piracy), was peripheral to Antilles and mainland alike. From the beginning of English settlement, therefore, the Bahamian people were a people apart" (Craton and Saunders 1992, 63). These observations illustrate the dual nature of the Bahamas' interpolation within the region. The archipelago itself stands between the Caribbean and colonial Europe. This in-betweenness thus extends to the people who began to settle there starting in 1648, providing them with a home in-between the mainland and the Caribbean. By 1666, the makings of a settlement on New Providence had taken shape, with perhaps as many as a thousand people living in small settlements on Eleuthera, its surrounding cays, and New Providence. But it would be another sixty years before the Bahamas started to stabilize as a colony (1720s), and that long again before the makings of the modern Bahamas were in place both demographically and politically (1780s). This book examines the role music has played in the formation of the political and national identity of the Bahamas. 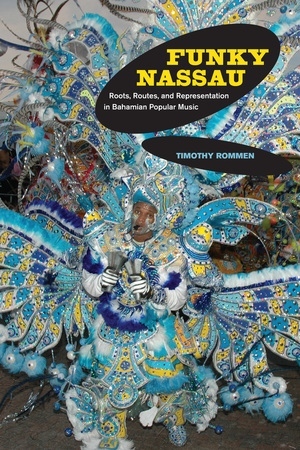 Timothy Rommen analyzes Bahamian musical life as it has been influenced and shaped by the islands’ location between the United States and the rest of the Caribbean; tourism; and Bahamian colonial and postcolonial history. Focusing on popular music in the second half of the twentieth and early twenty-first centuries, in particular rake-n-scrape and Junkanoo, Rommen finds a Bahamian music that has remained culturally rooted in the local even as it has undergone major transformations. Highlighting the ways entertainers have represented themselves to Bahamians and to tourists, Funky Nassau illustrates the shifting terrain that musicians navigated during the rapid growth of tourism and in the aftermath of independence. Timothy Rommen is Associate Professor in the Department of Music at the University of Pennsylvania. He is the author of Mek Some Noise: Gospel Music and the Ethics of Style in Trinidad (UC Press), which in 2008 was awarded the Alan Merriam Prize from the Society for Ethnomusicology. "This sensitive, bittersweet account of music-making in the Bahamas shows how a small, fragmented country that has been buffeted by powerful currents emanating from both the United States and the Caribbean has managed to produce a vibrant popular music of its own. Rommen carefully maps the political and cultural economies that are integral to this story, but he keeps the musicians themselves, their aesthetics and strategies, at the center where they belong. The result is a vivid and finely nuanced portrait of a unique musical culture that deserves to be better known."